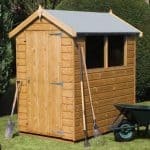 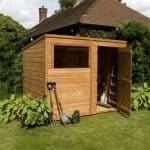 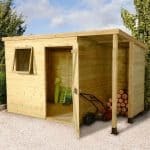 This is a stunning looking average size shed with a barn shape roof and wide, double doors allowing ease of transport for your garden equipment. 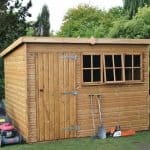 Complete with window feature allowing light and air and constructed from strong, hard wearing tongue & groove timber it is a fabulous looking piece which will look great for many years to come and securely store away all your toys, tools and garden furniture. 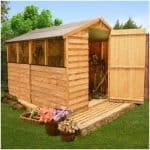 In a good looking honey colour which has been treated so it will retain its looks and won’t rot. 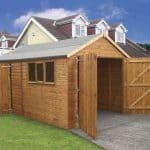 This is home delivered with assembly for your convenience.